This photo was not taken by NASA or the European Space Agency or the Air Force, or by any organization at all. 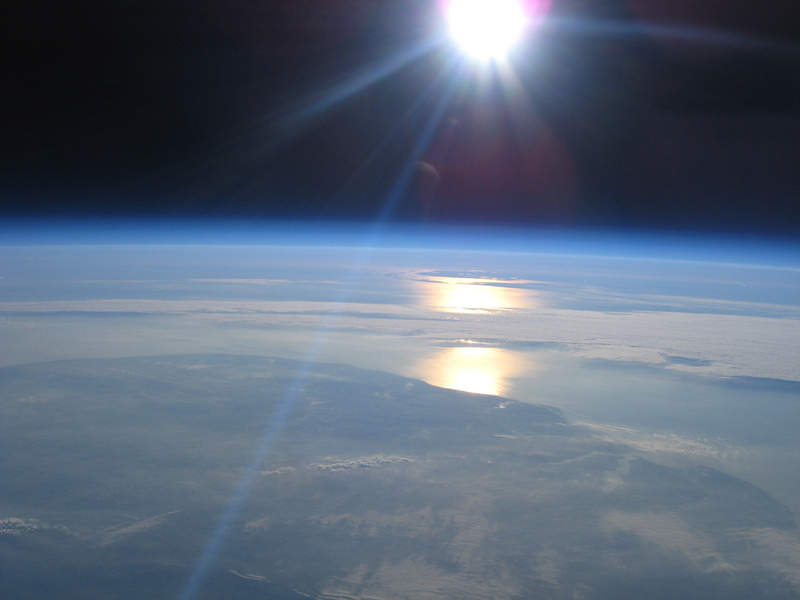 It was taken by Robert Harrison, a 38-year-old IT director from Yorkshire, who put a garden variety point-n-shoot digital camera on a helium balloon. According to Sky News, his rig cost about 500 quid, or just under $750. Harrison programmed a little gizmo that makes the digital camera take photos or videos at set intervals. The big load of goodies is at his Flickr site. Be sure to check out the Icarus 1 videos, they are mesmerizing. The balloon carries the camera up to 22 miles above the Earth, at which point the pod carrying the camera detaches from the balloon and parachutes back to the ground. Harrison uses a GPS locator to recover the camera. Twenty-two miles is 116,000 feet, or 35 km, still well within the stratosphere. That’s much higher than commercial airliners fly (around 40,000 feet), and in fact only a handful of manned aircraft are capable of flying over 100,000 feet. At that altitude the sky is black and the curvature of the Earth is obvious, so it is informally known as the “edge of space”. Space itself is quite a bit farther up. In the US, the definition of an astronaut is someone who has been at least 50 miles up (264,000 feet, 80 km). By comparison, on its final flight SpaceShipOne reached an altitude of 69 miles (112 km), and low Earth orbit starts at about 100 miles up (160 km). I bring that up just to establish context, not to detract at all from Harrison’s achievement. Getting pictures back from altitudes higher than those reached by the SR-71 Blackbird (~85,000 feet) on a budget of less than a thousand bucks is flat-out amazing. I wonder who will be the first to duplicate his feat? You are currently browsing the 10 Minute Astronomy blog archives for the day Friday, March 26th, 2010.